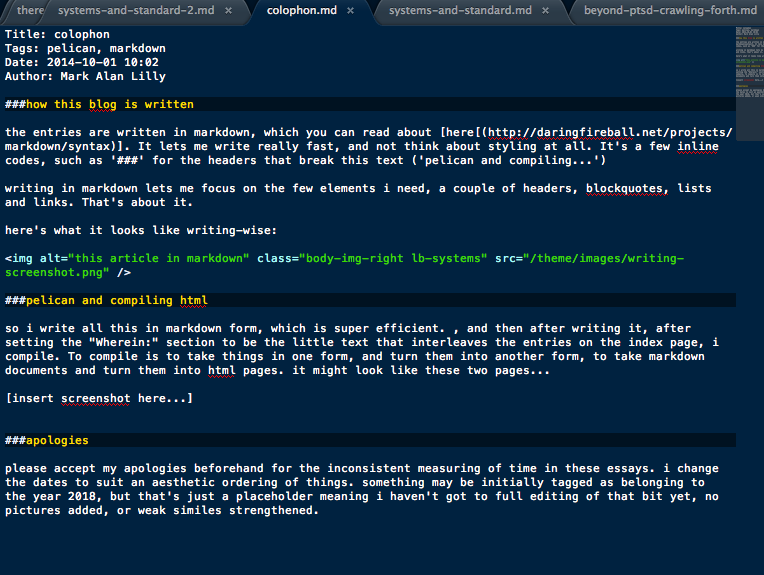 writing in markdown lets me focus on the few elements i need, a couple of headers, blockquotes, lists and links. That's about it. so i write all this in markdown form, which is super efficient, and then after writing it, after setting the "Wherein:" section to be the little text that interleaves the entries on the archive page, i compile it with pelican. To compile is to take things in one form, and turn them into another form, to take markdown documents and turn them into html pages. that compiles all the markdown files to HTML, then i push them to git and then pull them to the live site. it's geeky, but it works fast and it's fun.